Wellington Cottage, with its original mullion windows and pointed turret, was designed by Edward Blore and built for the first Viscount Combermere in 1837. The building gives a very romantic and picturesque impression as you approach it. The cottage name remembers the famous Duke, who was Lord Combermere’s mentor and godfather to his eldest son. Sleeps: Up to five guests. Can be booked with other cottages for larger group stays. 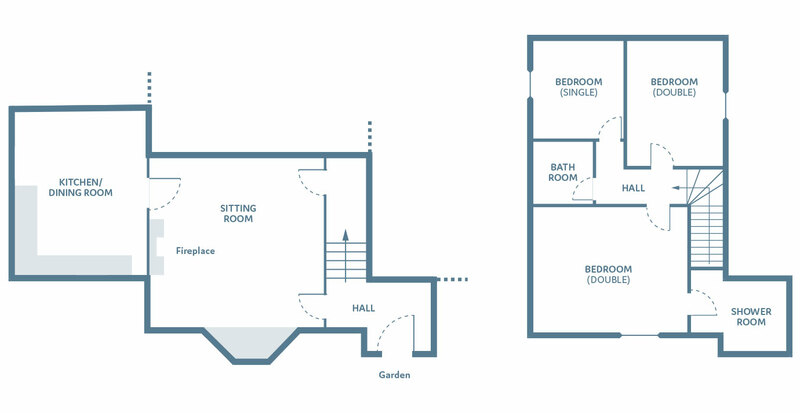 Bedrooms: Two double rooms and one single room. Bathrooms: One en-suite shower room and one shared family bathroom. The small entrance hall has amusing military pictures and leads directly onto the sitting room with its parquet floor and fireplace with wood burning stove. This elegant and light room, decorated in greens and warm reds and pinks, blend with the subdued paint colours used on the 19th century panelling, and the original bay window with its sitting alcove full of cushions is perfect for afternoons reading and relaxing. You step down into a state of the art kitchen with gas range and dining area with built in banquette and chairs and table. From the car park you enter directly into its private garden looking over the rolling organic parkland and its views of the Abbey. The staircase in the hall leads up to a landing off which is the elegant master bedroom and en-suite shower room in the turret. The warm tones of raspberry and hazelnut fabrics set off the large super king size bed and its faux fur throw, with curtains framing the mullion paned window. Across the landing is a dramatic double bedroom with a gothic four poster bed, painted in rich green with floral linen fabrics, looking over the inner cobbled courtyard. There is a further cosy single bedroom with its original fireplace (not working) and antique pine bed, decorated in hues of green and a shared bathroom with handle shower.